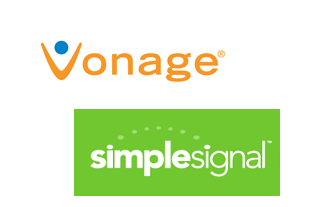 Vonage agreed to acquire privately-held Simple Signal Inc., a provider of Unified Communications-as-a-Service (UCaaS) and collaboration solutions to small and medium businesses (SMBs), for $25.25 million. SimpleSignal offers a broad range of voice, video, mobile and app services to address the evolving needs of SMBs, a market Vonage defines as businesses with 1 to 1,000 employees. SimpleSignal uses BroadSoft's BroadWorks platform to provide the VoIP component of its integrated portfolio of unified communications and managed solutions. The company has a strong base of 1,600 customers and additional white label partners. Vonage said it uses the same BroadSoft-based platform. "The acquisition of SimpleSignal deepens Vonage's penetration in UCaaS and demonstrates our commitment to execute on our organic and inorganic growth strategy in the sector," said Alan Masarek, Vonage Chief Executive Officer. "SimpleSignal is a natural complement to Vonage's rapidly expanding UCaaS business. It has a proven track record of providing feature-rich solutions required by larger SMBs, strong channel and strategic partnerships, and a common underlying technology platform. This acquisition further positions Vonage as a clear leader in Unified Communications."